Eastern shore of the Caspian Sea. Our team of adult volunteers from four US States and one Mexican volunteer made our way there September 2014, assured that this was the largest intercultural exchange this community had ever seen. We were also joined by Juan Carlos and Thoma, the son-in-law and grandson of one of our team members, who proved to be more helpful than we could ever imagine. Juan Carlos’ wife, Elise, is in the US Embassy in Baku and was also a tremendous help prior to the trip and hosting our team at her house prior to our departure. The final member of our group was Corey Jacobson, a local PCV, a fixture in the local community for the past two years, who labored tirelessly on this project. and bordered by Iran, Turkey and Russia. The country is found geographically and religiously at the crossroads of Europe and Asia, and Islam and Christianity, creating catalysts for centuries old contests. Most recently, Azerbaijan has been embroiled in a bitter rivalry with its neighbor Armenia over a disputed territory called Nagorno-Karabakh, a region primarily Armenian in ethnicity but given to Azerbaijan’s regional control in the former Soviet Union. Following the break-up of the Soviet Union, a war broke out over the disputed territory, first fought between farmers using tools and primitive weapons, escalating to full-fledged war with former Soviet military equipment dispersed to its former states legally and illegally. Close to a million Azeri refugees were uprooted from Armenia and relocated to refugee camps. To this day, Azerbaijan has as more refugees (1 in 7) per capita than any place on earth. A smaller, but equally tragic number of Armenians were violently forced out of Azerbaijan, creating homogenous communities with a deep hatred toward each other. Staying with host families, we were given great insight into the culture. Tomato, cucumber salad, a variety of meat kabobs, boiled beef and an abundant supply of bread were the typical foods of choice. Our host mothers would not eat with the men but sit back and watch and serve. Men were not allowed to wear shorts under any conditions. We were told not to initiate conversation with women and not to offer our hands in greeting. The women in our group learned quickly that very conservative gender roles are enforced through a variety of pressures. It was probably the most challenging trip for the women, in particular, and as they were treated as equal members of our team and participated in the construction and activities on the court, we hope that an alternative idea of what women are capable of may have been realized by some in the community, particularly the youth. We were also aware of the quickly deteriorating relationship between the US, the rest of the West and Azerbaijan. All Peace Corps Volunteers are being forced out of the country by December, Azerbaijanis who are working closely in partnership with US NGOs are being scrutinized, and any foreign education is being strongly discouraged. This combined with the incredible hatred toward Armenians (one of our sweet host mothers told us she wanted them all killed) makes me think the area is ripe for an escalation of the conflict. I hope I’m wrong. We had a chance to play with some of the boys on the court. We were even able to convince some girls to come down and play, cheering them on as they made their first shots with giant smiles on their faces. On any Courts for Kids trip there is usually a shift from the working days, where the locals have much more experience and we are the students, to playing the sport, where we become the relative experts. It is always great for both groups to have a chance to be the ones with knowledge to pass along. In this case, once the balls were out on the court, it was thrilling to be able to use our basketball knowledge to help these young children. Heading back to Baku to fly out was the beginning of the reverse culture shock experience. We left from Corey’s house, an abandoned shack with a ‘toilet’ that made quite the impact on our team. It was a ‘squatter,’ i.e. hole in the ground, with three walls and a roof barely holding it together. It couldn’t be called an outhouse, I think we settled on lean-to, and was open to the neighbors’ eyesight if nature called while they were outside in their yards as well. From this house, we made our way to the modern metropolis of Baku, complete with Maseratis, modern skyscrapers shaped like flames and city squares that could be from any city in Europe. It was hard to imagine going from two greater extremes. We left Azerbaijan believing this was one of the most challenging projects to date, yet also one of the most eye-opening, educational and enriching. We will definitely be sharing stories about this trip for years and years to come. This trip was absolutely invaluable to me. 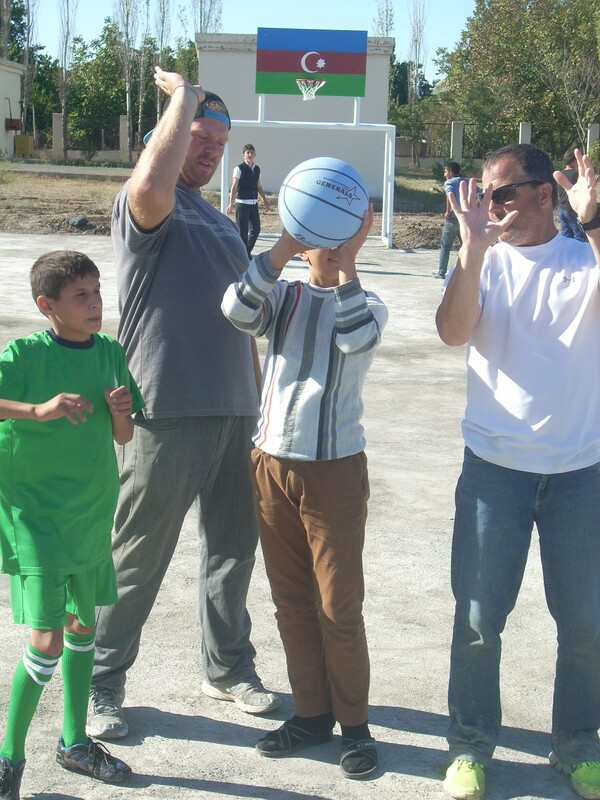 I went into Azerbaijan thinking I was going to be giving back to the community by building a court for kids, but what I didn’t realize was that my presence was a complete culture shock beyond anything that a basketball court itself could have provided. By showing that women can work hard, play ball hard, and be just as capable as men, I believe the community was able to see a small spark of hope for female empowerment. The boys went from harassing, ignoring, belittling, and trying to get the women volunteers off the work force to smiling, engaging, initiating a hand shake, conversing, and playing basketball with us.